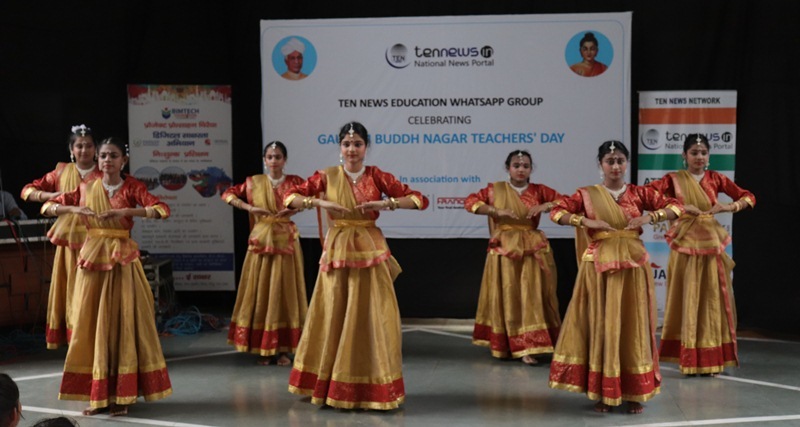 Teachers Day Celebration : Ten News felicitates educationalists from the district, dance, music and speeches make morning memorable! Greater Noida :– Sunday, 2nd of September witnessed an amazing blend of educationalists, students, social workers, parents and members from different sections of society all gathered together to honor the efforts and contributions of the eminent “Teachers”. Dr Anupam Verma, Deputy Director BIMTECH welcomed the guests and spoke about the significance of the occasion, “It is a honour for us to host this esteemed gathering. Teachers day is being celebrated on 5th of September since 1962. Dr. Radhakrishnan was a great teacher, philosopher and was admired for his personality by one and all. When his students wanted to celebrate his birthday with vigour and zeal, he only directed them to not to celebrate it as his birthday but in some other way. Hence it was decided to mark it as Teachers day. Teachers have always been a part of our lives since time immemorial. They have been significant to our culture and traditions”. The morning also witnessed motivational speeches by eminent personalities. Jamil Ahmed, Director General of Sarvottam Institute of Technology and Management inspired the students and teachers with his inspirational words. He said, “Practice, practice and practice because it will provide you with popularity, peace, prosperity. However this art can only be taught by a teacher and professor. It is teacher who expects nothing more than respect and honor and dedicates his life for the well being of his disciples. It is only the teacher who can teach you to convert gift of problems into an opportunity. We should start loving teachers and our school and should not unnecessarily criticize it”. Special kids from Corner stone school children mesmerized everyone with a beautiful song and skit presentation. Former DM of Gautam Buddh Nagar and senior IAS NP Singh said, “Nature creates a uniqueness in all its habitats. When we try to not to identify that unique ability but want to mold everyone in one way, we are doing it wrong. He also said that it is important that our education is able to do capacity building and create an individual’s identity. He also gave call to teachers to contribute with their best abilities in nation building and prepare a generation that is full of nationalism and skills to make India proud. YEA OSD Shailendra Bhatia recalled his student days and shared a memoir from those times to insist on importance of primary education. At the end Ranu Francis, Managing Director, Franciscan Solutions Pvt. Ltd, talked about student- teacher relationship and emphasized on the safety and security of students to be one of the most important priority of the schools and parents. The whole event was beautifully choreographed by Ashok Shrivastava of Navaratan Foundation. Also present during the occassion were Aditya Ghildiyal, Dr. Kuldeep Malik, Dr Sushma, Dr. Kcalpana Bhushan, Suneel Dwivedi, Reema De, Alok Singh, Sumita Vaid among others.